From our point of view, what is most interesting is not who is pushing this bill (Hollywood and the usual suspects that tried to kill the VCR because it would obviously destroy the movie industry) but who is not resisting. After all, whenever the issue of network neutrality comes up, the big telecom companies pay a bunch of organizations like Americans for Prosperity to create astroturf movements to oppose a "government takeover of the Internet." Of course, network neutrality is the opposite - a set of rules where the government requires corporations not dictate how subscribers use the Internet. But here we have a literal government takeover of the Internet. 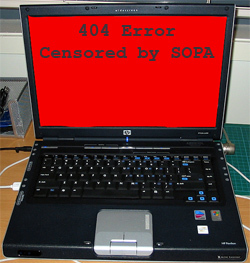 Should SOPA pass, the federal government would decide what sites are allowed to be accessed by Americans and which cannot. The evidence thus far suggests that more sites will be harmed by incompetence as opposed to intentional political censorship but the entire approach is troubling, to say the least. To get a sense of which elected officials are supporting this legislation, here are the cosponsors for HR 3261 in the House and cosposors for S 968 in the Senate. More details on how you can be involved at Demand Progress. Many of the organizations who have strongly fought for an open Internet with strong network neutrality rules are pouring resources into stopping SOPA. This includes Free Press's Save the Internet, Public Knowledge, and others. Some of the network neutrality opponents, like the Wall Street Journal and Cato Institute have also warned against SOPA but other groups -- like Americans for Prosperity have been fairly silent. The next time AT&T and Time Warner Cable-sponsored groups start fear-mongering around policies that threaten to bring competition against their corporate sponsors, we must ask them where they were when the future of the Internet was truly threatened. The Future of Music organization has reviewed an alternative to SOPA that may be a much better approach. Below is a video about SOPA. Image credit: monkeyc on Flickr.